It’s hardly surprising that apartment dwellers who rent are worse off financially than homeowners. It takes money to buy a house. But things got markedly worse for renters after the Great Recession. Millions of homeowners, foreclosed on by their lenders, were thrown back into the market for apartments, driving up rental rates and squeezing all renters. A new FINRA Foundation report, “American Renters and Financial Fragility,” dramatizes the growing rift between the nation’s haves and have-nots through a comparison of owners and renters. For a growing share of older Americans, housing expenses have become an increasingly large financial burden. One in three Americans over age 50 were carrying a severe or moderate housing cost burden in 2012, up from one in four in 2000, according to a new study by Harvard’s Joint Center for Housing Studies and AARP. The Center defined a severe burden as housing costs that consume more than half of household income; a moderate housing burden takes between 30 percent and 50 percent of income. The Center’s report, “Housing America’s Older Adults – Meeting the Needs of An Aging Population,” warns that the nation is unprepared for both the financial and non-financial housing challenges that will accompany the coming explosion in the elderly population. Aging baby boomers will require better access to public transit, handicap access, assisted living facilities and other special services and amenities, and many will need subsidized housing. 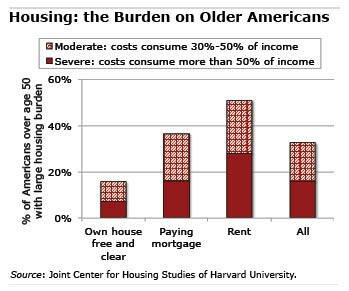 Housing is often an older person’s largest single expense. 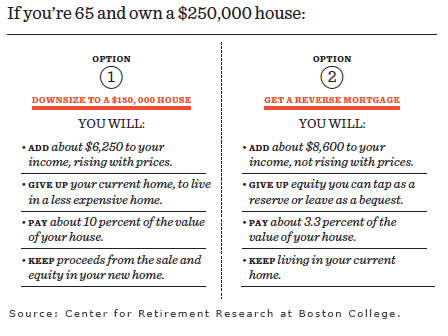 And because housing costs are largely fixed (think mortgage payment, taxes, insurance, upkeep and utilities), they can become a growing burden for people as they age and become more vulnerable to reductions in income. Incomes often decline toward the end of their working years and decline again when they enter retirement. Pensions and Social Security benefits fall again when one spouse dies.